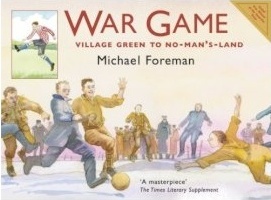 Michael Foreman’s ‘War Game’ is an award winning children’s book published by Pavilion Books. It tells the story of four friends, Will, Freddie, Billy and Lacey, who don’t want to miss out on the adventure of the First World War. Sadly they soon realise the grim realities of war and the sacrifices made. The main characters are all based on Michael Foreman’s uncles who all died in the First World War. Watch Michael Foreman talking about the book in the War Game Documentary. Play the ‘War Game’ video game. Download an education pack with lots of activities linked to ‘War Game’. Read other real life stories from World War One.